We often stumple upon this question: Aren’t effort and duration the same thing – what’s the difference? In short: No, effort and duration are not the same. Here's a quick and easy explanation. Time management is one of the most important aspects of project management. To be able to estimate your project time accurately you will need to have a proper understanding of the two concepts effort and duration. 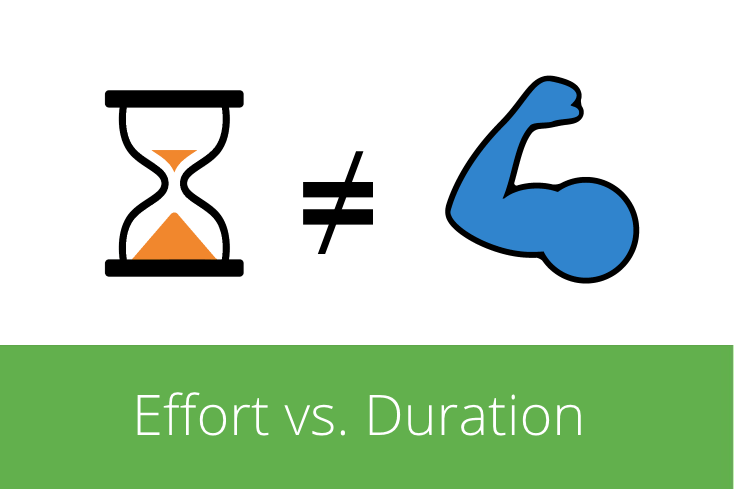 So what is the difference between effort and duration? Effort is the number of people hours needed to complete a task, i.e. it’s the actual time that is spent on working on the project. Effort can be measured in people hours, days or weeks. So in order to estimate the duration of our fence project, you will have to determine the effort first. Let’s say you have estimated that it would take around 30 active work hours to complete the fence, then the effort will be 30 hours. Remember that this doesn’t mean that the fence is ready IN 30 hours – unless you’re planning on building the fence for 30 hours non-stop. Duration on the other hand is the total time that it takes to complete the project measured in work days, hours or weeks. The duration depends on the availability and capacity of resources. For example, if you dedicate 3 hours a day to work on the fence, then the duration would be 10 days (30 hours total effort divided by 3 hours/day). 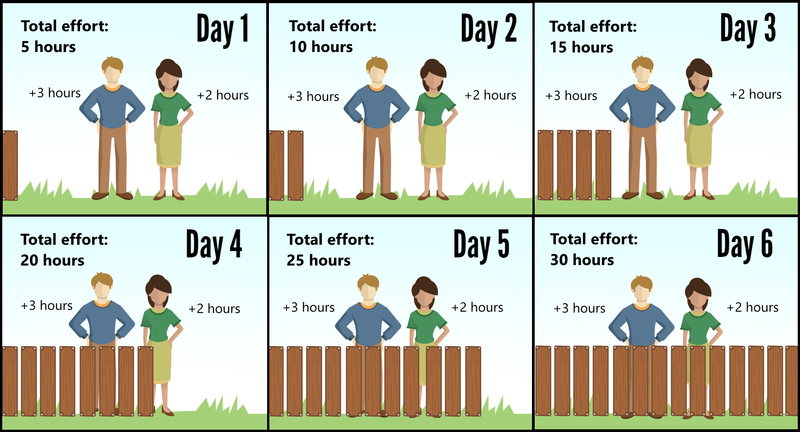 But if you have a friend helping you out with the fence every day, then you would have two resources working 3 hours a day on the fence = 6 hours a day, so the duration is 5 days (30 hours total effort divided by 6 hours a day). 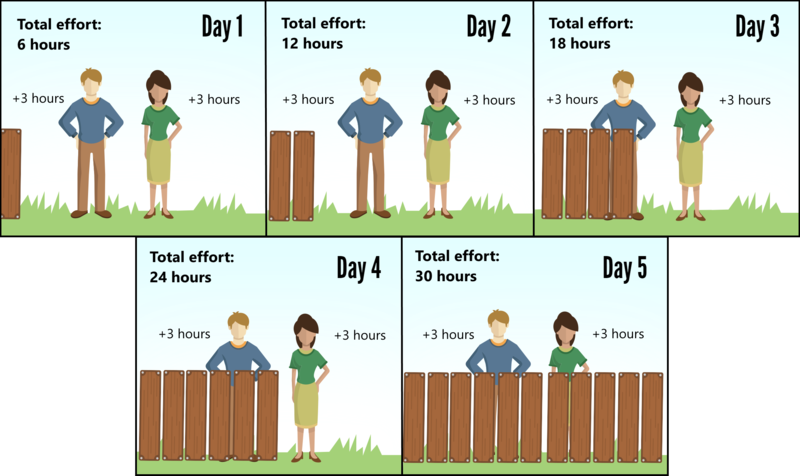 However, if your friend can only spare 2 hours a day to help you with the fence, the duration extends to 6 days since your resources only work 5 hours a day on the fence. The total effort is always 30 hours, no matter if there is one or two people working on it. You can’t reduce the effort to 15 hours if two people work on it, but you can reduce the overall completion time. Quick and Easy: The Difference Between Effort and Duration - InLoox • Copyright 1999-2019 © InLoox, Inc. All rights reserved.